Published in 1678, The Pilgrim’s Progress is the world’s most significant piece of English Christian literature. It has never been out of print, has been translated into over 200 languages, and is considered to be the first novel written in English. This Easter, Revelation Media is bringing an adapted, animated version of the classic tale to theaters. Starring John Rhys-Davies as Evangelist, this epic story will come to life on the big screen for a limited time only. 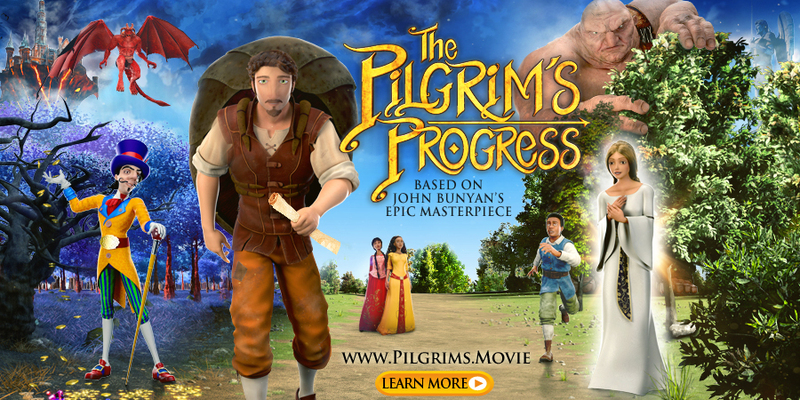 Next month, I’ll share my review of THE PILGRIM’s PROGRESS and give away tickets to see it in theaters. Make sure you’re following me on Twitter and Instagram so you don’t miss an opportunity to enter that giveaway. Based on John Bunyan’s epic masterpiece, THE PILGRIM’S PROGRESS is one of the most popular books of all time, and one of the most important stories of our faith! Second to the Bible in total copies and translations, the story was written by John Bunyan a pastor, imprisoned for sharing his faith. This powerful allegory helps families understand the spiritual journey is the most important journey in life, as well as the importance of sticking to the path, even when the journey gets difficult. Theatrical release for 2 days only! April 18 & 20, 2019 Easter weekend! You can buy tickets now at pilgrims.movie to see THE PILGRIM’S PROGRESS on Thursday, April 18th or Saturday, April 20th. Leading up to the theatrical release of THE PILGRIM’S PROGRESS, I’m giving away three (3) digital interactive storybooks. You will have multiple ways to enter. Choose one or choose all! Disclosure: I received a free copy of The Pilgrim’s Progress Digital inteactrive Storybook in exchange for hosting this giveaway. I read the book, definitely a classic for anyone. No, I haven’t read the original novel yet.